The Reymann Memorial Ayrshire Herd at West Virginia University is one of the oldest continuous Ayrshire herds in the nation. Over the herd’s 119-year history, Lawrence A. Reymann and West Virginia University (his successor) have given great care and attention to the continued development of the herd through genetics, breeding, and improved management techniques. As the university continues its mission to preserve and improve this herd, officials will be hosting an event on September 28, 2017 to celebrate their success and inform the public about their efforts, specifically the value of rotational grazing. The event (held at 1400 Stewartstown Rd., Morgantown, WV 26505) will run from 10 a.m. through lunch, which will be held at 12:30 p.m. Despite big dreams for his herd, Lawrence A. Reymann passed away at the young age of 31. His brother Paul O. Reymann, who later became the President of the Ayrshire Breeders Association (1921-1923), took over management of the herd and later donated Cacapon Farms (a farm owned by Lawrence) and the herd to the West Virginia University Agricultural Experiment Station. The herd has had some instability over the years, but is in capable hands today. 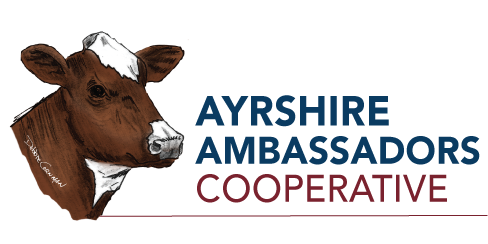 Ben Walsh, the Associate Director of Farm Administration and Operations, is an experienced herd manager with a keen desire to return the Ayrshire herd to the elite prominence which it once held. In addition, the College of Agriculture, Natural Resources and Design is under the leadership of Dean Daniel Robinson. With his oversight, the herd has continued to develop and thrive, and two small research projects have been launched with grants from the U.S. Ayrshire Breeders Foundation. The herd, which consists of 31 milking and young cattle, has tremendous potential. Currently, nine embryos (coming from excellent Ayrshire dams and sired by 100% Ayrshire bulls) are implanted in Holstein heifers. This isn’t the only method by which the herd is growing, though. Two animals have been donated by the Reymann Memorial Syndicate, including naturally polled Plum Bottom Ryder Lenore and Plum Bottom Pluto Athena. Rotational grazing, which has improved the health of the herd and reduced feed costs, has also been instrumental in the herd’s success. Attendees will have an opportunity to learn more about the advantages of rotational grazing at the event on September 28. Please join us at West Virginia University for a celebration of the Reymann Memorial Herd and an informative discussion about rotational grazing!